I am originally from Kilmarnock but moved down to London 8 years ago. I work as a professional musician for musical theatre shows and currently play guitar on Motown the Musical at the Shaftesbury Theatre. I started running using the couch to 5k app a few years ago and haven’t stopped since! I managed to lose 4 and a half stone and this motivated me to keep running and move onto longer distances. I started out with my first marathon in New York in 2017 and since then have gone on to run London, Paris and several other smaller marathons around the country. I am running Chicago this year and hope to eventually complete the marathon majors. 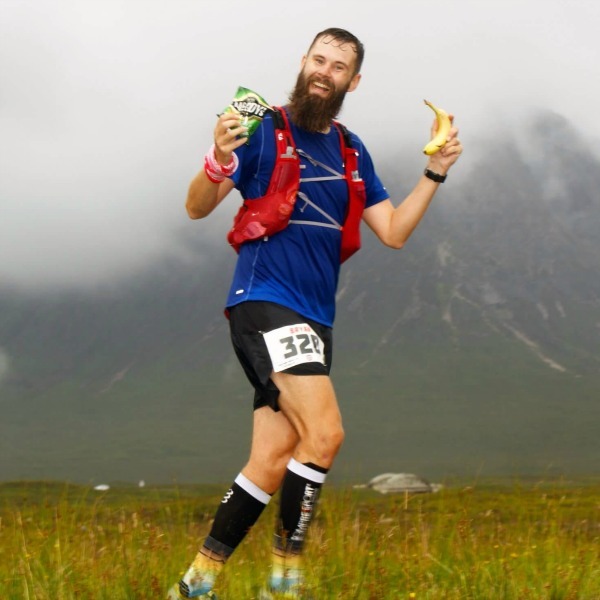 I ran my first ultra last year – The London to Brighton 100k and followed that up with the Devil O The Highlands. I hope to complete my first 100 mile race at the North Downs Way later in the year. I fell in love with the WHW after going on a walking holiday with my wife a couple of years ago. When I found out there was a race that took place along the whole route then I knew I wanted to come back and run it. My aunt has run the race before so she is partly to blame! This will be the longest race I have ever taken part in so the aim is just to finish! Ideally I would love to finish in 24 hours but as long as I have a good time out there I will be happy!